MOSCOW (AP) — Defying the United States, Russia granted Edward Snowden temporary asylum on Thursday, allowing the National Security Agency leaker to slip out of the Moscow airport where he has been holed up for weeks in hopes of evading espionage charges back home. The 30-year-old former NSA contractor now has plenty of room to roam throughout the sprawling country and continue the bizarre journey that has already stretched across half the planet — from Hawaii to Hong Kong to the Russian capital. The move infuriated the U.S. administration, which said it was "extremely disappointed" and warned that the decision could derail an upcoming summit between President Barack Obama and Russian President Vladimir Putin. The asylum offer places a significant new strain on already-corroded relations with Washington amid differences over Syria, U.S. criticism of Russia's human rights record and other disputes. But Russia appears to have reckoned that ending Snowden's airport limbo was worth intensifying the political standoff. The decision gives Russia cover to depict itself as a defender of human rights, pointing a finger to deflect criticism of its own poor record and tough crackdown on dissent. Snowden himself made that argument. In a statement issued by WikiLeaks, which has been assisting him, Snowden was quoted as saying that "over the past eight weeks we have seen the Obama administration show no respect for international or domestic law, but in the end the law is winning." "I thank the Russian Federation for granting me asylum in accordance with its laws and international obligations," he said. 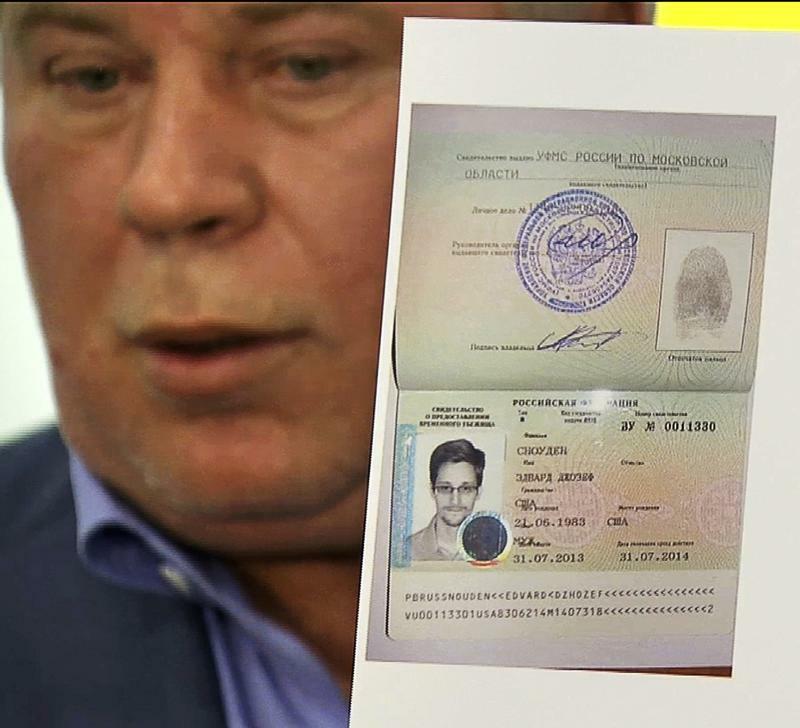 Snowden's attorney, Anatoly Kucherena, was shown on Russian television holding a passport-like document issued to Snowden by Russia's Federal Migration Service and valid for one year. He refused to disclose the former NSA contractor's whereabouts, telling reporters at the airport: "He now is one of the most sought-after men in the world. The issue of security is very important for him." In its statement, WikiLeaks said only that Snowden was headed to a "secure, confidential place" after departing Sheremetyevo Airport in a taxi accompanied by the group's legal adviser, Sarah Harrison. It said Harrison had been with him throughout his 39 days in the airport transit zone. Despite the phalanx of photographers and reporters camped out at the airport, no one apparently saw the former NSA contractor leaving, except for someone who snapped a photo of Kucherena talking to blurry figures whom the attorney later said were Snowden and Harrison. Snowden departed his home in Hawaii for Hong Kong about three weeks before revealing himself as the source of reports in The Guardian newspaper of a vast surveillance program by the National Security Agency. As Washington put pressure on Hong Kong to extradite him, Snowden boarded a flight to Moscow on June 23. He was booked on another flight from Moscow to Cuba, presumably en route to seeking asylum in a Latin American country. But he never got on that flight. The United States had cancelled his passport, so he lacked documents to board the plane or enter Russia — leaving Snowden stranded in an airport no man's land. The U.S. has demanded that Russia send Snowden home to face prosecution on espionage charges. Putin dismissed the request and made clear with the granting of asylum he has no intention of changing his mind. "We are extremely disappointed that the Russian government would take this step despite our very clear and lawful requests in public and private that Mr. Snowden be expelled and returned to the United States," said White House spokesman Jay Carney. "Mr. Snowden is not a whistleblower" or a dissident, Carney said. "He is accused of leaking classified information. He should be returned to the United States as soon as possible." U.S. lawmakers also reacted angrily, insisting there be serious repercussions for Putin's decision to snub the Obama administration and that the U.S. must re-evaluate its approach to Moscow. Even before Russia's move Thursday, some lawmakers were calling for the U.S. to boycott next year's Winter Olympics in Sochi, Russia. "Russia's action today is a disgrace and a deliberate effort to embarrass the United States. It is a slap in the face of all Americans," said Sen. John McCain, R-Ariz. "Now is the time to fundamentally rethink our relationship with Putin's Russia." Snowden initially applied for Russian asylum, but Putin said it wouldn't be considered unless he promised to stop leaking information, an indication he was sensitive to offending Washington. Snowden withdrew the request, but later made the promise and reapplied — effectively forcing Russia's hand. The one-year asylum Snowden was granted can be extended indefinitely, and he also has the right to seek Russian citizenship. There was no clue about where Snowden will live in Russia, or what he will do. Whether Snowden, an advocate of openness and human rights, will adapt well to a country widely criticized for stifling dissent and stepping on human rights is guesswork. Kucherena would say only that his client has American friends assisting him. Snowden reportedly earned high pay as an NSA contractor, but how much money he has on hand in a notoriously expensive city is unknown. Still, he now has the right to work in Russia, and late Thursday, the founder of Russia's Facebook-like social network site VKontakte, made what sounded like a job offer. "We will be happy if he decides to supplement the team of star programmers at VKontakte," Durov wrote on his page. Venezuela, Nicaragua and Bolivia had offered Snowden asylum and in mid-July he told a meeting with human rights figures that he wanted to visit all those countries. But Kucherena said Thursday that "he doesn't have such plans, for now." Russian law says Snowden would forfeit his asylum if he left Russia for "a place of residence." Although the asylum document does not appear to give him the right to travel abroad, the Geneva Convention on Refugees, of which Russia is a member, says refugees must be provided documents allowing them to travel outside the country. A spokeswoman for the Federal Migration Service said she could not immediately clarify whether Snowden could leave Russia. Snowden's father said on Russian television Thursday that he was grateful for the asylum given his son and that he plans to come to Russia to visit him. Lyudmila Alexeyeva, a veteran of Russia's human rights movement and head of the respected Moscow Helsinki Group, welcomed the news on asylum for Snowden, but added that his quest for freedom of information has landed him in a country that has little respect for that and other freedoms. "Having fought for the freedom and rights, Snowden has ended up in a country that cracks down on them," Alexeyeva told the Interfax news agency. Vladimir Isachenkov and Laura Mills contributed to this report.